Movement does not require LOS. Otherwise it would be impossible to willingly walk through a Fog Bank (or even a Wall of Fire or Thorns in a pinch). LOS is only required when something calls for you to be able to establish a target. So since you dont have to target your destination zone, and teleport lets you bypass the wall you can just pop right to the other side of it. The Wraith is cool, melee Weak tokens are really handy. He can make for a pesky guard, forcing an opponent to attack an incorporeal creature with a Weakening counterattack, and as mentioned hes synergetic with Plague Master. Hes also good to sic on Grimson users, since he can pop through walls and start cutting down ranged attack damage. All in all, hes a good unit though. A Teleport "subtype" in and of itself is not restricted by LOS the Teleport Incantation spell has restrictions placed on it by the text of the card. The Grey Wraith can teleport into an adjacent zone regardless of LOS, as per the text of the card. So then it's the fact that you teleport to "target" zone in the Incantation (meaning you have to have LOS to the zone) as opposed to "adjacent" zone (which ostensibly means no targeting/LOS required) for the Wraith (and move action to the next zone for Gremlin, which although worded differently seems to similarly lack any need to target that zone)? I just want to be clear. Ohhhh I hadn't thought about using him as a guard!!! So what do we think of the Nightshade Lotus -- a bit expensive at Level 3 for a single attack. You spend 7 mana for an unavoidable, no effect 3 damage (which is worse than pretty much every other attack spell) and then pay additional mana for Sleep at a slight (or somewhat more than slight if high-level target) discount... Is the action economy (attack + a really good effect in sleep) worth the level? I don't know. That said, I'm not entirely sure if it's a single attack. It doesn't have the once per round wording that most conjurations that attack repeatedly do (wizard's tower, tower of light, etc. ), BUT if it is NOT a repeat attacker and we're just talking a single attack like Tanglevine, why does it have hps if it's not doing anything after it drops the attack? For Druid plant/vine synergy? The nightshade lotus is a conjuration that can make that attack every turn. If you stay in it's zone it will dust you with poison. In addition it has a one time "Sleep Spore" it can use to knock someone out. All in all, it's a pretty potent static defense. That's a pretty sweet defense indeed, then. I'm surprised that the sleep is one time use only. In playtesting did you consider making it like the Warlords ballista where it has to build up one or two rounds before being able to use it again? The one time use seems somewhat weakened when compared to some of the below mentioned 'Conjurations with Attacks'. Overall still pretty cool though. Anything that adds to vine tactics is a good thing though. Why does it not follow other cards such as: "Once per round before or after a friendly units action phase..... use a ready marker to keep track of this." Its a lvl 3 spell, and that appears to me to be 1 level too high to ever include more than 1 of them. Also it doesnt have regen like most other plants. I like the idea of the card but it seems fairly weak to me.  Where is this card previewed? Agree with jacksmack from card parameters described so far: level 3 (for 7 mana, why break the correlation?) is biggest barrier to play. At level 3, for more mana (tougher with plant regeneration), I'd expect a reloading in-zone Sleep like Ballista (forget the damage). Not having ready marker text seems strange if it's a repeatable attack. How do you time making the attack and remember you cannot make it again that round? Unless it is zone upkeep damage, so just a Poison Gas Cloud? Is damage poison? To go with psychic Sleep? Is this a hoax card? Someone copy the card here please? It's all fun and games until someone loses an eye. And then it's just fun. I would always check the facebook page first. Let's forget the lack of mention of how to trigger its attack (creatures have activation markers, conjurations have ready markers, abusable but not in this passive case). Threat: a Rooted 3 dice Poison and (one-shot pay mana) Psychic attack, so much immunity for both out there. 3 attack dice means 1.5 damage against anyone with 3 armour. Should be critical damage. Yet it does not hinder while "vine markers" hinder. Pay mana means you need to have mana spare to activate its main effect. Resilience: spend 3 spell points (only 7 mana) for a 7 life unarmoured object that can be one-shotted (especially by a Fireblast) before it can do anything? Sorry but this card does not make sense at all. Designed as it is (not like a Ballista), this should be a Nature Trap with one-shot damage and Sleep. In this case, a fear of ready marker abuse is not an issue as it is a passive conditional effect, like being attacked by a Psylok. You have to move the target into its zone or the opponent has to voluntarily accept the attack by moving in (probably when you have no mana to activate its Sleep attack). Please design team re-think this card. The soporific trap plant is a very strong dinosaur lands fantasy trope but it should be a one-shot Trap enchantment. Even then, poison and psychic... ugh. Thankfully this card has not made it to the official News site so can remain a FB beta-test feedback. Edit: Oh, just re-read the Gate to Hell. It would be two full actions to use, plus it wouldn't hit any conjurations...so, yeah, not that great after all. Still might be fun, although not as worth it. As for the Lotus, eh...it's ok. As others have mentioned, it's a bit expensive for its low attack. Since you have to pay extra for the Sleep, I don't think they needed to make it cost 7 for it's base attack. This probably won't see tons of play, but I'll at least try it out. Threat: Rooted Poison and Psychic attacks, so much immunity out there. 3 attack dice (thought it was 3 direct damage) which means 1.5 damage against anyone with 3 armour. Yet it does not hinder while "vine markers" hinder. Sorry but this card does not make sense at all. Designed as it is (not like a Ballista), this should be a Nature Trap with one-shot damage and Sleep. In this case, a fear of ready marker abuse is not an issue as it is a passive conditional effect, like being attacked by a Psylok. They have to be moved into or voluntarily accept the attack. They posted something on FB about there being a new rule in the DvN rulebook that explains how to work Conjurations with attacks. I'm sure it will use the ready marker mechanic, they just put it in the rulebook so they don't have to re-print that text on every card that uses it. I agree with you 100% that this should have been a trap, or at least had a way to get more Mist counters. As it is, this card seems very weak. Sadly, this late in the game, I highly doubt there's anything they can do to fix it since I'm sure it's at the printer by now. Conjuration attacks such as this one are covered in the DVN Rulebook. Triggering it's attack will make more sense then. I can see your point about a nature trap. That would have been an interesting idea to go with. Though at that point the card is completely passive. I'm dependent on my opponent walking a creature into that zone. With this you're guaranteed to "sleep" the creature you want by using your quickcast effectively. If you get to attack more than twice with this card regardless of sleep it's made it's value.